The PICOOC Mini has a square body with an edge length of only 26 cm and a height of only 2cm. This makes it small and lightweight, but does not sacrifice quality. A strengthened glass surface is just as natural as the beautiful PICOOC design. We've made sure that the connection and configuration between your mobile device and your Mini are smart. Easy and fast. The surface is made of tempered glass, into which the X-shape body sensors gently embed themselves. The large feet on the underside provide a stable stand. The shapely Uni Body housing makes the scale even more robust. 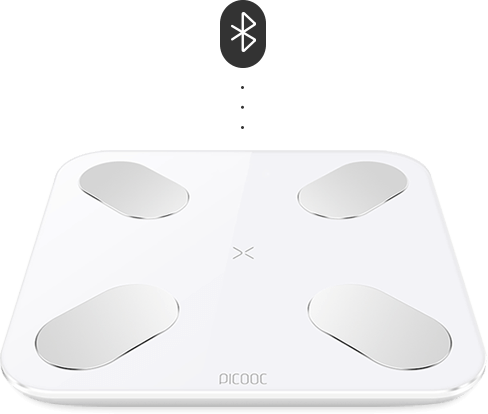 The high-precision weight sensors capture even the smallest changes in your body. Together with the BIA body fat microsensor, your body information is captured faster and every measurement is more accurate. Our mini is equipped with a red ultra-bright LED display, which invisibly fits under the glass surface. When activated, clearly visible and easy to read, even in strong sunlight.